I feel kind of neurotic when people ask "How far along are you?" and I can immediately proclaim "18 weeks 3 days!!" I attended a prenatal yoga class last week and when I posed the same question to the other girls, they all hesitated. "20.... 24 weeks? Ish?" Is this standard first-time-mom hypervigilance, or just another quirk of my (naturally hypervigilant) personality? Moving on... 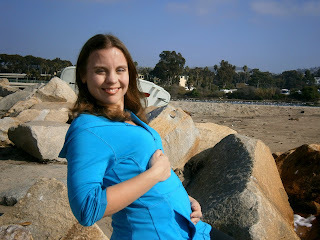 I have to say, though pregnancy has not been entirely smooth sailing so far, I do feel like I've gotten off rather easy. I had a wonky appetite and nausea for the first trimester, but nothing crippling - I only puked 3 times (in case you were curious!) Fatigue, sure, but my normal levels of energy are usually intense to the point of being frightening, so it was kind of nice for me (and for everyone else I'm sure) to take a few guilt-free evenings off to lay around in bed, read and sleep. I still managed to work out at least 3 times a week, though with much lower intensity than I am accustomed to. And I felt.... I don't know, peaceful? You'd think, with all the uncertainties and changes experienced in the first trimester, it would have been reasonable to freak out a bit. I never felt really worried though - not cocky, not arrogantly certain that I was in control and things would be fine, just generally okay to go with the flow and accept whatever nature, and my body, handed me. It was nice. Then of course, the second trimester hit, along with random bouts of anxiety. I realized, after we made it past the critical stage and I saw/heard proof via and ultrasound and doppler that Baby Ojo is alive and well, that in all likelihood THIS IS REALLY HAPPENING! Suddenly, all those little aspects of my life that I have been taking for granted flashed before my eyes and sent me into a panic. No more lazy mornings in bed with my husband. No more leaving the house randomly for weekend adventures. No more fitting in the gym or a run any time I have a chance, spending my evenings wrapped up in myself working on my private projects, having spontaneous dinners with friends. I may never again have a clean house. My money, and my body, are no longer entirely my own. Yikes. I know these are normal concerns and partially driven by an intense surge of hormones (I kid you not, I cry at just about everything these days. I cry because I'm too happy; I cry because I'm neither happy nor sad but feel like I should be; I cry when we run out of hummus, etc). Still, I really didn't think I'd be prone to so much doubt about this situation. This wasn't an "oops, we're pregnant." This was intentional, I wanted this, we are ready for it. Even so, I think I'm entitled to have mixed emotions about all the changes we are facing. Despite the doubts and fears, all it takes is passing a baby in the grocery store or spending time with my friends' kids to realize that we made the right decision here. I picture all the positives that come with having a little one, all the joys and frustrations and sweet moments, and all my worries quickly become background noise. I already have so much love for this little 6-inch person kicking my bladder, and I know the next year is going to be one of the best, if most challenging, we've ever had. I hope to be posting more often these days on all the various issues that come up during the course of pregnancy (and motherhood, eventually! ), including some of the more controversial decisions we have made. For now, off to do laundry and get ready for the week! Yay! I am excited you posted this. Even though we keep each other posted, it is inspiring to see your thoughts published here... it makes me think about me and my own little family brewing! Lots of love to you cute two little Ojos...soon to be three! Alright, got it. If RAISING QUALITY HUMANS were easy, everyone would be doing it. And we all know the majority of them aren't. So you, as a quality human, are therefore honor bound to your species to procreate and provide ME with baby chai masala love muffins to snoodle. That comes with some sacrifices.